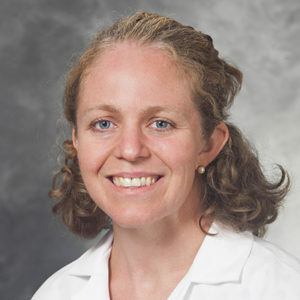 I am an assistant professor in the Department of Human Oncology and serve as the primary radiation oncologist at UW Cancer Center Johnson Creek, where I treat all adult cancer sites. I have a particular interest in using radiation to treat breast, prostate and lung cancers and benign diseases such as Dupuytren’s contracture. I also focus on palliative care and symptom management. I have a strong interest in working in a community setting. The technologies at UW Cancer Center Johnson Creek enable me to treat almost any kind of cancer and perform most of the same procedures as at the UW main campus. This enables me to provide continuity of care and develop strong relationships with my patients. Managing patients’ care is one of the best parts of my job. We’re working together to get rid of their cancer using a therapy that challenges them mentally and physically. Helping them get through that is very rewarding. In addition to my clinical role, I have the opportunity to teach UW radiation oncology residents. PURPOSE: To report the American Society for Radiation Oncology (ASTRO) 2017 radiation oncologist (RO) workforce survey results; identify demographic, technology utilization, and employment trends; and assess the profession's ability to meet patients' needs, offer job satisfaction and attract high-caliber trainees. METHODS: In spring 2017, ASTRO distributed an online survey to 3,856 US RO members. The questionnaire was patterned after the 2012 workforce survey for trend analysis. The 31% response rate yielded 1,174 individual responses (726 practices) for analysis. RESULTS: ROs' mean age was 50.9 years. Compared to 2012, female representation (28.9%) increased and white representation (69.8%) dropped. The proportion in rural practice (12.6%) decreased, while suburban ROs (40.6%) increased, and urban ROs (46.8%.) remained high. Most ROs worked full-time, averaging 51.4 hours/week. Stereotactic body radiation therapy, cone beam CT, and MR/PET-CT fusion utilization increased, while low-dose-rate brachytherapy decreased by >15 percentage-points. Hypofractionation utilization was 95.3%, highest in academic/university systems and lowest in private solo practices (p < 0.001). More respondents were concerned about an RO oversupply than shortage. ROs reported 250 consults (median) and 20 on-treatment patients (median) in 2016, and greater time allocation to electronic health record management compared to three years earlier. Approximately 15% of ROs reported job vacancies, and were more prevalent in urban practices and academic/university systems. ROs were employed by academic/university systems, private practices, and non-academic hospitals 2:2:1. Comparison with 2012 showed a shift from private practice towards academic/university systems and non-academic hospitals. Compensation was predominantly fixed or base salary at academic/university systems and non-academic hospitals, and productivity at private practices. Practice merger/buyout was the lead reason for ROs to change employers. CONCLUSIONS: Since 2012, race and gender gaps narrowed but geographic disparities persisted, with ROs gravitating towards resource-rich suburban and urban locations over rural practices. The workforce has shifted from private practice predominance to more equal balance with academic/university systems. These findings reflect the current US RO landscape and remind of the need for collective action to ensure equitable RO care for all patients. PURPOSE: To investigate interobserver delineation variability for gross tumor volumes of primary lung tumors and associated pathologic lymph nodes using magnetic resonance imaging (MRI), and to compare the results with computed tomography (CT) alone- and positron emission tomography (PET)-CT-based delineations. METHODS AND MATERIALS: Seven physicians delineated the tumor volumes of 10 patients for the following scenarios: (1) CT only, (2) PET-CT fusion images registered to CT ("clinical standard"), and (3) postcontrast T1-weighted MRI registered with diffusion-weighted MRI. To compute interobserver variability, the median surface was generated from all observers' contours and used as the reference surface. A physician labeled the interface types (tumor to lung, atelectasis (collapsed lung), hilum, mediastinum, or chest wall) on the median surface. Contoured volumes and bidirectional local distances between individual observers' contours and the reference contour were analyzed. RESULTS: Computed tomography- and MRI-based tumor volumes normalized relative to PET-CT-based volumes were 1.62 ± 0.76 (mean ± standard deviation) and 1.38 ± 0.44, respectively. Volume differences between the imaging modalities were not significant. Between observers, the mean normalized volumes per patient averaged over all patients varied significantly by a factor of 1.6 (MRI) and 2.0 (CT and PET-CT) (P=4.10 × 10(-5) to 3.82 × 10(-9)). The tumor-atelectasis interface had a significantly higher variability than other interfaces for all modalities combined (P=.0006). The interfaces with the smallest uncertainties were tumor-lung (on CT) and tumor-mediastinum (on PET-CT and MRI). CONCLUSIONS: Although MRI-based contouring showed overall larger variability than PET-CT, contouring variability depended on the interface type and was not significantly different between modalities, despite the limited observer experience with MRI. Multimodality imaging and combining different imaging characteristics might be the best approach to define the tumor volume most accurately. PURPOSE: To report updated feasibility and reproducibility results for high-dose-rate noninvasive breast brachytherapy (NIBB) for tumor bed boost with whole breast radiation therapy (WBRT) in the setting of expanded patient and treatment facility number. METHODS AND MATERIALS: Fifteen independent community-based and academic centers reported 518 early-stage breast cancer patients from July 2007 to February 2015 on a privacy-encrypted online data registry. All patients' treatment included lumpectomy followed by combination of WBRT and NIBB. NIBB was completed with commercially available (AccuBoost, Billerica, MA) mammography-based system using high-dose-rate (192)Ir emissions along orthogonal axes. Harvard scale was used to grade cosmesis. RESULTS: Total patient cohort had median followup of 12 months (1-75 months) with subset of 268 having available cosmesis. Greater than 2- and 3-year followup was 29% and 14%, respectively. Entire cohort had 97.4% excellent/good (E/G) breast cosmesis and freedom from recurrence of 97.6% at the final followup. WBRT timing with respect to NIBB delivery demonstrated no statistically significant difference in E/G cosmesis. Achieved E/G cosmesis rate was also not statistically significant (χ(2)p-value = 0.86) between academic and community institutions with 97.8% vs. 96.6%. CONCLUSIONS: NIBB represents an alternative method for delivery of breast tumor cavity boost that has shown feasibility in a diverse group of both academic and community-based practices with reproducible early cosmesis and tumor control results. Recommendations are updated noting ideal timing of boost delivery likely to be before or early during WBRT given equal cosmesis and less documented treatment discomfort. PURPOSE: Palmar and plantar fibromatosis (PPF) is a progressive connective tissue disorder of the hand/foot that often leads to debilitating functional impairment. In Europe, orthovoltage radiation therapy (RT) has been demonstrated to prevent local disease progression for up to 80% of patients with early-stage PPF. There are limited data reporting outcomes for populations outside of Europe or using electron RT. METHODS AND MATERIALS: Between 2008 and 2013, 44 early-stage PPF cases received RT. RT fields involved clinically defined targets encompassing involved areas (skin changes, cords, nodules) with at least 1.5-cm margins. En face electrons (6-12 MeV) and bolus (0.5-1 cm) were selected individually. Outcomes are reported for patients who participated in an institutional review board-approved standardized questionnaire and chart review. RESULTS: Thirty-three patients received 66 treatments (45 hands/15 feet and 6 reirradiations). Most frequent dose schemes were 21 Gy (3 Gy in 7 fractions) and 30 Gy (3 Gy in 10 fractions with 6- to 8-week breaks after 15 Gy). Median time to follow-up survey was 31 months. Disease progression at any location within or outside the RT treatment field occurred in 20 of 33 patients (61%). Fourteen of 60 sites (23%) developed in-field progression, but 4 sites were successfully reirradiated with final local control in 50 of 60 sites (83%). RT improved pretreatment symptoms of pain with strain at 30 of 37 sites (81%) and itch/burn sensations at 17 of 21 sites (81%). There were no reported grade ≥2 late toxicities even with reirradiation. Patient reported overall success with treatment was 31 of 33 patients (94%). CONCLUSION: PPF is a progressive disease. En face electron RT is an effective therapy that stabilizes or improves symptoms in the majority of patients. Reirradiation can be considered as a treatment option for in-field progression. Patients report minimal toxicity and a high rate of satisfaction with treatment. PURPOSE: A majority of patients enrolled in hospice have advanced cancer. Most of them are burdened by symptoms related to uncontrolled tumor growth. Although palliative radiation therapy (RT) is highly effective, only 1% of hospice patients are ever referred. Commonly cited concerns include high treatment cost, burden of travel for multiple visits, and a perceived reluctance of radiation oncologists to deliver single-fraction RT. METHODS: A clinic offering affordable RT to patients in hospice was developed to simplify the intake, reduce cost, and minimize travel to a single visit. The goal was to evaluate, simulate and plan treatment, and treat patients with a single fraction of palliative RT within a 4-hour period. RESULTS: The initial 18-month experience is reported in this Health Information Portability and Accountability Act-compliant report that was approved by the Virginia Commonwealth University Institutional Review Board. Eight referrals were received from local hospice agencies that had not referred any patients in previous years. A telephone screening process avoided unnecessary travel for two patients who were not candidates for RT. Two additional patients who were evaluated with a same-day computed tomography simulation were not good candidates for RT. Ultimately, four patients were successfully treated with single-fraction palliative RT of 8 Gy. None had to disenroll from hospice. CONCLUSION: This novel program increased access to palliative RT for patients in hospice who would otherwise not have been referred. The main challenge identified was a need for ongoing educational activities at hospice agencies where staff turnover may be high and understanding about palliative RT can be limited. Single-walled carbon nanotubes (SWNTs), being hydrophobic by nature, aggregate in water to form large bundles. However, isolated SWNTs possess unique physical and chemical properties that are desirable for sensing and biological applications. Conventionally isolated SWNTs can be obtained by wrapping the tubes with biopolymers or surfactants. The binding modes proposed for these solubilization schemes, however, are less than comprehensive. Here we characterize the efficacies of solubilizing SWNTs through various types of phospholipids and other amphiphilic surfactants. Specifically, we demonstrate that lysophospholipids, or single-chained phospholipids offer unprecedented solubility for SWNTs, while double-chained phospholipids are ineffective in rendering SWNTs soluble. Using transmission electron microscopy (TEM) we show that lysophospholipids wrap SWNTs as striations whose size and regularity are affected by the polarity of the lysophospholipids. We further show that wrapping is only observed when SWNTs are in the lipid phase and not the vacuum phase, suggesting that the environment has a pertinent role in the binding process. Our findings shed light on the debate over the binding mechanism of amphiphilic polymers and cylindrical nanostructures and have implications on the design of novel supramolecular complexes and nanodevices.